Color: Matte silver and gold paired with classic gray bangles. Description: This is a sophisticated set with just a touch of gold glitter. Yes, these fantastic glass bangles are REALLY made of glass! We custom create each of our handmade bangle sets just for you. The key to wearing glass bangles is to get the correct size. 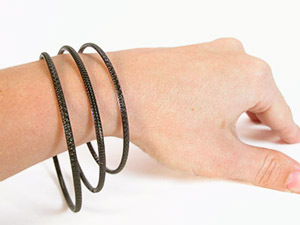 Wearing the proper bangle size will lead to less breakage and a better look. If you are new to Indian glass bracelets, you should expect a bit of breakage while you get used to them. No worries! This is perfectly normal and why you get so many bangles in a set! We offer three different sizes, 2.6 Small, 2.10 Medium/Large (the most popular), and 2.12 Extra Large. There are four different ways to find the correct bangle size. See them on the video below and instructions are below the video. They are listed below from most to least accurate. The best way to ensure a perfect fit is to try on actual glass bangles. We offer a Glass Bangle Sizing Kit specifically for the purpose. It's only $2.99 with free shipping. You also get a coupon for $2.99 for your next order, which makes it free! Buy the Glass Bangle Sizing Kit here. Take out good-fitting bangles that you already own and measure the INSIDE diameter. Compare that measurement to the below chart to find your size. Print out the sizing template (making sure it is to the proper scale), cut out the circle, and try to fit your hand through the different openings. Print the template from the link below. This is the least accurate way to find your size. I suggest trying the above methods unless you have no choice. Make you hand as small as possible, as if you were putting on bangles. Use a flexible tape measure around your hand at the widest point. Do this at least THREE times to make sure the masurement is true. Compare that measurement to the below chart to find your size.